The Mughal emperor Akbar would be showered with coins when he entered or exited the palace on his elephant. The coins, popularly known as nisaari sikkay, were scooped up by peasants in the elephant’s trail. The Lahore Museum owns some 1,200 nisaari sikkay, bearing the emperor’s stamp and about an inch in circumference. But just a few are actually on display at the museum. In fact, only 70 of the thousand or so coins on display are originals. The rest are replicas. The museum stores about 45,000 original coins, dating from 6 BC to 2010 AD, in its reserves. Naushaba Anjum, the museum’s coin keeper, says insufficient security and lack of interest among visitors are the main reasons that most of the originals are generally kept hidden away. “Most visitors are unaware of the value of these rare, centuries-old artefacts. Otherwise there would be more burglaries,” she said, adding that the museum had the biggest coin collection in the subcontinent. She recalled the relief among museum staff in 1988 after a burglary in 1998. “They mostly stole replica coins from the Indo-Greek era. The officers were so relieved that the originals were in the reserves,” Anjum said. She said putting originals on display also increases the risk that they will be damaged. “The best way to share information about the coin collection is to write about them in the museum’s annual bulletin or newspapers,” she said. “When coin collectors, scholars or students want to study something they get in touch in advance and plan a visit,” she said. A table has been set aside in the reserves room for anyone interested in studying coins. Anjum said the museum had acquired six collections of coins from various eras over the last ten years, but some coins were not on display because of a lack of technical expertise in producing replicas. After the 1988 incident, officials imprinted the originals of the stolen coins on plaster of paris and produced new replicas in laboratories. But the replicas produced were not as good as the ones produced during British rule. The recent collections acquired by the museum include 1,200 nisaari coins, 150 Indo-Greek (2 BC) era coins and 20 punch-mark coins (6 AD) purchased in 2006 with the help of a Rs200,000 donation from the Qarshi Group. The same year, the then Parks and Horticulture Authority director general purchased 210 Mughal coins and donated them to the museum, along with some Pakistani coins. Some 214 Mughal coins were donated from Okara. Ten coins of the late Mughal period were donated by the Express news group in 2009. In 2004, a farmer gave the museum 465 copper coins from the reign of Nasir bin Karlik, ruler of Sindh in 13 AD. A few originals from these donations, such as the 6AD punch-marks and Pakistani coins, are now on display. Earlier, coins from British India between 1849 and 1947 were the only originals on display. Details of all the coins in the reserves are mentioned in 20 hardcover catalogues lined up against the shelves in Anjum’s office. She added that a lack of funds meant these catalogues had not been published.“They state the mint [region of origin], script and language, date, emperor’s name, year of rule, cultural sign, date of issuance and any poetry written on the coin. Images of both sides of the coins are also included,” she said. Anjum said that the most precious coins in the museum were from the Sikh era, and it owned most of the coins ever found. The reserves have just over 45,000 coins. “They are safe here as only VVIPs are allowed in on state visits. The keys lie in a strong room,” she said. It is our choices...that show what we truly are, far more than our abilities. -J. K. Rowling. Corinium Museum, Park Street, GL7 2BX, Cirencester.One of the ten treasures of the Corinium Museum is the Civil War coin hoard. 309 coins were found purely by chance hidden in a lead pipe under a barn in 1981. For those who love to study ancient coins, the coin collection at the National Museum in Delhi is nothing less than a treasure trove. With a whopping 1672 coins on display, the collection amazes one with its variety, rarity and antiquity. Starting right from the 6th century BC, when coins are believed to have first appeared in India, the collection takes you through the entire history of coinage in the country. Each coin, highly informative and beautiful par excellence, has a story to tell. 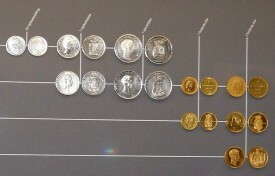 Apart from the coins, which are displayed in a modern and user friendly format, the gallery has thoughtfully prepared dioramas to depict various techniques of coin production. There are wondrous punch marked silver coins. The most interesting ones are the ‘bent-bar’ shaped coins from the Gandhara region, now in Afghanistan. Then there are the exquisite coins from the Indo-Greek, Parthian and Scythian rule. A coin bearing the image of Greek ruler Seleucus is eye-catching. The deputy curator of the museum, Dr R K Tiwari, says that the entire history of Greek rule in India has been constructed through coinage. Next to it, one sees the amazing ‘re-struck’ coins from the Western Kshatrapa rule. Dr Tiwari explains that many rulers appeared in the regions of Maharashtra and Gujarat shortly after one another during this period. Unable to change all the coins of the previous ruler, they would simply get their names and images re-imprinted on them. The Mughal coins are stunning with beautiful inscriptions of Quranic verses and rich, narrative content. On one hand, there are Akbar’s ‘Ilahi’ coins, which celebrate his religious ideals, while on the other, there are coins depicting Jehangir drinking a glass of wine. The British coins are as majestic, bearing images of various Viceroys and Queen Elizabeth herself. One can also see modern Indian coins and currency notes in their many denominations. The various credit cards, which are put on display, bring one back to the comfort and convenience of today’s age. But the ancient little beauties leave one marveling at the long history of coinage and skilled artisans. At The Bishop Erazm Ciołek Palace, the Museum will be presenting an exhibition entitled Numismatic Rarities from the Collections of the National Museum in Krakow (6.04 – 1.07. 2012). This will be the first opportunity for a number of years to see these most prized and fascinating Polish coins. An important event for enthusiasts and numismatists alike, the exhibition also aims to augment the ranks of devotees to the field, particularly in view of the fact that plans for 2013 include the opening, after an interval of more than seventy years, of the Emeryk Hutten-Czapski Museum. The first department of the National Museum in Krakow, the Emeryk Hutten-Czapski Museum has been closed since 2009 for modernisation under the auspices of the European Centre of Polish Numisnatics project. IT’s only a penny, but it must be worth a mint – a rare coin, discovered in the Alnwick area, from the time when Northumberland was ruled by Scotland. The silver piece was found by Brian Gray while searching with a metal detector, who reported his discovery to the local Portable Antiquities Scheme officer at the Great North Museum: Hancock. Because Mr Gray found only one coin, it was not declared treasure, and it has been bought by the Society of Antiquaries of Newcastle upon Tyne for display in the museum. And not only is it rare, but it’s also in excellent condition. The coin was minted in Carlisle between 1136 and 1152 for Henry, crown prince of the Scottish throne, who also happened to be the Earl of Northumberland and Huntingdon. At the time of its minting, much of northern England was under Scottish dominion due to the conflict between Stephen and Matilda, the rival claimants to the English throne. The coin was purchased by the Society of Antiquaries of Newcastle upon Tyne with the assistance of the V&A Purchase Grant Fund and the Headley Museums Archaeological Acquisition Fund. It fills a gap in the society’s important coin collection of 5,000-plus coins, which includes the famous denarius of Cleopatra and Mark Antony. Photo caption: The rare Prince Henry coin. Full marks to RBI!! Must visit for numismatists/enthusiasts visiting Mumbai. CHENNAI : Post Independence Sino-Indian diplomatic relations may be only a few decades old. However, China and ancient Tamils shared a trade relationship that dates back hundreds of years. This is amply demonstrated by an expo on ‘Select Coinage of Tamil Nadu’ at the Centenary Exhibition Hall of the Government Museum in Egmore. “An identified coin is a piece of history,” says N Sundrarajan, curator, numismatic section of the Museum, summing up its import. The Museum in Egmore has a collection of three coin hoards from China discovered in Tamil Nadu. Around 1,822 coins were discovered in 1944 form the second hoard of Chinese coins from Thallikottai, Mannarkudi Taluk in Thanjavur district dated between 713 CE to 1265 CE. In the third lot are 323 coins discovered in 1962 at Olakkunnatham in Pattukottai Taluk. These coins are dated between 126 BCE to 1241 CE. He mentioned the presence of a bi-lingual inscription, now in China, dated 1203 CE, perhaps done during the period of the last of the Cholas. The inscription talk about a person named Samudhara Perumal who made an offering at the Seeru Kanniswaran Udaiyar Kovil for the well-being of a Chinese Emporer named Che-ka-cai-kan. Some Chinese annals refer to Raja Raja Chola as Lo-t-sa- Lo-t-sa Chu-lien, added the numismatics curator. Other coins on display are some from the Sangam period, Roman coins and coins of the ancient Tamil Kingdoms of the Cheras, Cholas and Pandiyas. The expo is open to the public from 10 am to 4.30 pm till May 24. NAGAPATTINAM: The archaeological museum, housing many rare ancient objects would be relocated to a new building, district collector T Munusamy said here on Tuesday. Speaking to reporters after inspecting the museum, he said it had rare collections of paintings, numismatic objects, bronze and stone sculptures, biological specimen, ancient musical instruments and several other artefacts. The museum is now located in an old British-era building. "Considering the value of the articles, as a precautionary measure, the museum will be relocated to a new building," he said. A rare Iron Age coin hoard is on its way to St Neots Museum after a last-minute fundraising appeal secured £22,000 in grants and donations. The museum, in New Street, will make its biggest-ever purchase when 68 gold coins – discovered by a metal detector in Kimbolton in October 2010 – arrive next year. The British Museum in London had given the museum’s curator Liz Davies a deadline of the end of July to raise the £22,000 purchase price before the coins were sold on the open market. After launching an appeal at the start of July, the museum landed £11,000 from the V&A Museum Purchase Grant Fund and a string of donations from residents and community groups. It has now been awarded a £6,000 grant from the Headley Museum’s Archaeological Acquisition Fund, making up the outstanding amount of money. Liz described the purchase as a “great success for the museum”. She said: “The museum would like to thank everyone who has helped us to achieve our fundraising target. “It is really great to be able to keep this wonderful Celtic treasure in the local area. “We will now be focusing on preparing a Heritage Lottery Grant application to redisplay our gallery about the early history of St Neots.” The proposed upgrade will include a high security case for the coin hoard, an off-site storage facility and a transformation of the Old Court Room into a community and learning space. The collection was declared treasure trove at an inquest in Huntingdon last year and was sent to the British Museum. The hoard came from South Lincolnshire between Caesar’s invasion of England in 55BC and the conquest by Claudius in AD43. A detailed list of major donors is expected to be released soon and further details about when the coin hoard will be on display will be discussed at the next museum management committee meeting in early September. Details about events and activities to celebrate the purchase will be released in the autumn. The State Ceremony and Honour’s Hall (Ulan Bator) have been open to the public for nine days. Over 8,300 local and foreign people have visited the Governmental Palace and seen the exhibition so far. Out of over 2,000 exhibits of the State History Museum, selected 150 were displayed at the hall. One of the most magnificent exhibits was undoubtedly a copper coin of Guyug Khan, which is the only one which exists in the whole world. People will be able to visit Government Palace and the hall from 9.30 to 17.00 o’clock everyday but Monday. The Chief of the State Ceremony Department, J.Sereejav, claimed, “The citizens are expressing their honour for the Chinggis Khan Monument and seeing the exhibits which symbolize Mongolian state history. They seemed to be very glad to be able to pray in front of the Nine White Banners. Until the new year, museum artifacts will be changed every month. Also, finds and artifacts, stored at the Institute of Archaeology in the Mongolian Academy of Sciences, of Khitan and Hunnu Era will be displayed at the hall in late September. 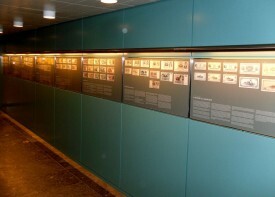 On 21 August 2012 a new permanent coin exhibition opened in Danmarks Nationalbank's lobby (Copenhagen). 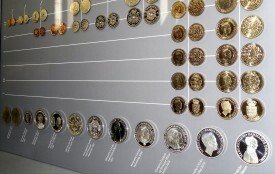 The exhibition is a beautiful and inviting set up of Danish coins produced from 1818 to 2012. It is a result of collaboration between the former director for the coin production Hans Denkov and the architect Teit Weylandt. 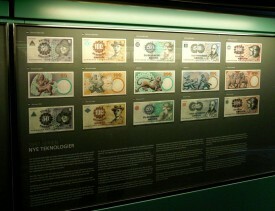 Banknotes have been displayed in the corridor between the lobby and the banking hall since the building was taken into use in 1976-1978. 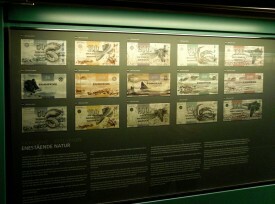 With the new exhibition it is possible for the public to see both coins and banknotes displayed in Danmarks Nationalbank. The exhibition is open for the public during the opening hours of Danmarks Nationalbank Monday to Friday from 9 a.m. to 4 p.m.
Every experience, good or bad, is a priceless collector's item. 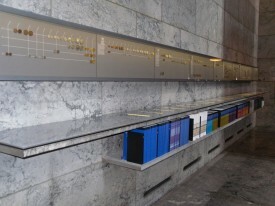 Denmark National Bank's section of floor displaying coins & banknotes. (Raman is a Chennai-based numismatist). Rajendra Chola I was the son of Raja Raja Chola I and one of the greatest rulers of the Tamil Chola dynasty of India. He succeeded his father in 1014 CE as the Chola emperor. During his reign, he extended the influence of the already vast Chola empire up to the banks of the river Ganga in the north and across the ocean. Rajendra’s territories extended to coastal Burma, Srivijaya (Sumatra, Java and Malay peninsula in southeast Asia) and Pegu islands. Burma and Indo-China were subordinate to the Cholas till Kulothunga I’s reign. Rajendra defeated Mahipala, the Pala king of Bengal and Bihar, and to commemorate the victory, built a new capital called Gangaikonda Cholapuram. He also built a Siva temple at Gangaikonda Cholapuram, similar to the Thanjavur Brihadisvara temple. He assumed titles like Parakesari and issued gold, silver and copper coins in the denomination of kazhinju, madai and kasu. He used Tamil Grantham and Devanagari legends on his coins. He also issued many commemorative coins with his titles Yuddhamalla, Uthama Chola, Maturantakan, Mudikonda Cholan, Rajendraka and Gangai Konda Cholan, on special occasions. Since the Cholas ruled for more than 275 years, starting from Raja Raja I to Kulthonga III (985 CE – 1256 CE), almost all Chola kings issued coins. As a part of Chennai museum’s special exhibit this week, coins on display were issued by Rajendran Chola I with the title Gangaikonda Chola. In the coin, both sides are similar; on top of the coin there is a parasol flanked by two flywhisks, in the centre, a bow, a seated tiger and two fish flanked by two lamps, and at the bottom Nagari legend ‘Gangaikonda Chola’. Since Rajendra Chola I ruled from TN–Orissa, Nagari, the common language of that period, was used in the coins. The symbol above the Nagari script is also available in the seals of the copper plates. These symbols may be the royal symbols of the Cholas. Regrettably, so far, no Chola coin has been found with complete Tamil legend.